1. a person who takes up an art, activity, or subject merely for amusement, especially in a desultory or superficial way — if you have the chance, do watch the hilarious TV series Mapp & Lucia for examples of Dabblers-Dilettantes Supreme. 2. a lover of an art or science, especially of a fine art. I'm guessing Hiram Green's dilettante combines amusement with love for the creation of fragrances? 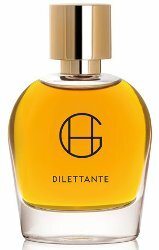 Hiram Green's new perfume, Dilettante, debuted recently and it's a heady mix of fruit, flowers and spice. Dilettane's orange note is deep and syrupy (not a fleeting squirt of orange juice or a drop of airborne oil from an orange peel). The orange is a perfect match for Dilettante's vibrant opening of strong orange blossom and green notes. Dilettante is mood altering; for me, this is one of the "happiest" perfumes I've smelled in a long time. Situated between the oranges and orange blossoms are more flowers (a mildly indolic jasmine? a touch of creamy tuberose?) and cloves — for awhile Dilettante smelled like a large bouquet of pungent stocks. There's also a hint of vegetal muskiness in Dilettante's base. The perfume broadcasts its different facets widely (it has great sillage) and has good tenacity for an all-natural fragrance. In its style, Dilettante reminds me of fragrances by another favorite perfume house of mine, La Via del Profumo. Dilettante is (as all scents can be) unisex but if you don't like overtly floral perfumes, try before you buy. Dilettante instantly became my favorite Hiram Green creation and it arrived just in time for summer enjoyment (I guess...I wore it while gardening one evening and every bee, fly and wasp flew on over to sniff me). If summer finds you in the concrete jungle, Dilettante will help you imagine a summer garden in full glory. Hiram Green Dilettante is $165 for 50 ml. (Mr. Green: thanks for getting rid of the bulb atomizers used on earlier Hiram Green perfumes!) For buying information, see the listing for Hiram Green under Perfume Houses. 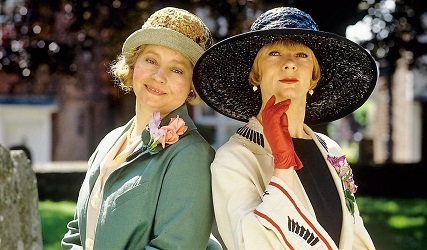 Note: top image of Prunella Scales (l) and Geraldine McEwan (r) in "Mapp and Lucia"; editorial use of the photo is courtesy of ITV/Rex. I don’t know anything about Dilittante, but I adore the Mapp & Lucia series, but even better are the original books by E. F. Benson. Love, love, love them, and re-read them annually. Me too!- I re read them almost annually. I do not re-read them that frequently, but agree — great books, and perfect beach reading. Love the (first) series too (haven’t seen the newer one). And second everything Kevin said about Dilettante — except can’t decide if I like this one or Moon Bloom better. Priscilla/mayfly…I read the books after seeing the series…for once, I was not upset by the visual memories…love Geraldine McEwan. This sounds wonderful, the scent of stocks is one of my favourite summer smells. And I adore Mapp and Lucia, the novels are absolutely wonderful, so sharp and witty, Lucia is a fantastic creation! Incidentally, E.F Benson lived at Lamb House in Rye, which is quite near me, and Henry James Before him, so a rich and interesting literary heritage there. I haven’t tried anything by Hiram Green, will have to see if there’s a stockist in London. Mayfly, hope you can find it! Mayfly, there’s a little pharmacy type set-up called Content, in Bulstrode Street in London – it’s a lovely little spot; quite near The Attendant, a marvellous coffee shop with excellent food which is in a former underground Victorian era public loo – worth a visit if you’re in the area. Believe Roullier White in Dulwich also stock Hiram Green – more of a detour but depends where you are! Hope you find one or t’other. I’m so excited about this one! I was seriously considering a blind buy, but resisted and am waiting for my sample(s) to arrive. I like Shangri-La, love Voyage and orange blossom is my favorite note. I appreciate everything about this house – the pacing of releases, the evident thoughtfulness, and now the new bottle sans atomizer! Holly…was so glad to see that atomizer disappear. I have samples of Dilettante and Moon Bloom on the way, yay! Sterling, enjoy! I think those are the best. I’m tortured by this! Since I’ve loved all Hiram Greens so far (and Shangri La above all other perfumes ever) I’m sorely tempted to blind buy this. So hard to come by samples (or at least so ridiculously expensive with shipping + impending postal strike) in Canada. I guess I’ll get a chance to save up while the strike is on! Great to see your take on Dilettante, Kevin. And we are both very timely – I wrote about it today as well. I just popped over to read your review as well, lucasai. Excellent as well. I don’t have a lot of experience with all-naturals but I’m always amazed as the longevity and heft that Hiram Green perfumes manage to give. Thank you both. I don’t know how he’s doing it, his perfumes are so persistent and long-lasting. Usually natural fragrances wear off from my skin after 4-6 hours. Yes, there are long lasting and it makes me a bit suspicious…. Lucasai, yes, Dilettante is “in the air” apparently! Will head over shortly to read! This is going on my must try. Since this is unisex does it pull more towards the masculine or feminine side of the scale? I have tried Moon Bloom and Shangri La and found both to be very fun for the summer, though Moon Bloom was not love at first sniff. Lovestosmellgood, I’m betting most would say it veers more towards feminine…. Great! Can’t wait to try it, mine is winging it’s way to me even now. And as a die hard AbdesSalaam fan, I’m thrilled to see it compared to La Via Del Profumo, one of my all time favorite houses! Woo hoo! Patiently, oh, so patiently I wait for my sample from Twisted Lily. It sounds just lovely – a summer garden in full bloom – plus, I’ve got a new author to try! Moon Bloom is amazing but does not make it past an hour on me. I hope this one does a better job. I’m still milking the sample of Voyage that Gi sent me and find this to be one of my favorite vanillas. Oh, it sounds heavenly. IMO, it’s a seal of approval when bees start trying to drink/pollinate an orange blossom perfume (I’ve had that happen before, too). ???? So, I’m sold; it’s on my sample list! Creosote: that would make a cute “Seal of Approval”…a little golden bee. Yes! …Though, I fear Guerlain would object. ???? Thanks for this review, Kevin — this sounds so lovely! Isn’t it a great feeling, to find a truly happiness-inducing fragrance? We all need one, or six, or ten. This one is promptly going to the top of my to-sample list. I’m curious — why did people not like the atomizers on the original Hiram Green bottles? I have a bottle of Moon Bloom with the atomizer, and I sort of love it — the nod to retro glamour, the fact that I can control how much I spray by how hard I squeeze. Atomizers are generally considered not good for preserving perfume quality, so those who doesn’t use perfume quickly would prefer to avoid them. I agree with you on the retro glamour, though. I value Voyage for the nostalgia: it smells just like a 1970s head shop to me with incense, Indian block print bedspreads, shesham wood boxes, sandalwood soap, etc. I’ll give this a try when I get a chance. For the Mapp and Lucia fans, you can do a tour of Rye via Google streetview and see landmarks like Lamb House and the house with a crooked chimney. I’m a huge fan. Bought myself a birthday present of a giant hardback omnibus edition with all the books and a couple of short stories, and it lives permanently on my bedside table and it takes me about a year to get through it and start over. Both TV series are good, and contain different bits from the books, but I’m always disappointed that wonderfulness like Lady Ambermere and Pug are missing. As to Hiram Greene, have only tried Shangri La, and to my nose it was a dead-on duplicate for Rochas Femme (90s version). Being a late adopter I’m months overdue to comment but for what it’s worth, Dilettante’s opening is really green on me and reminded me for the first 15 minutes of Vent Vert, softened somewhat. Then it becomes intensely floral, very beautiful and yes, elating. Its character is truly natural and has amazing sillage – my husband thought I’d bought fresh flowers and said the whole house was scented. Husbands and bees are never wrong. Longevity was good too. I would seriously consider a FB for its elating effect and the very rare confluence of scent taste between me and the people I share a house with.